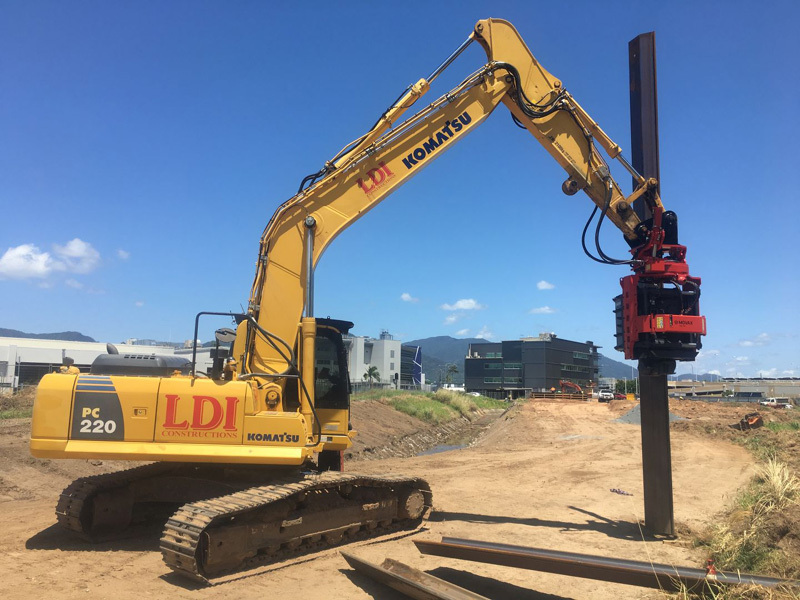 After considering a range of options, Australian contractor LDI Constructions recently purchased a Movax SG-45 Side Grip Vibratory Pile Driver from Premier Rock Machinery for use on a culvert drain upgrade project in the Cairns CBD. LDI is saving up to three quarters of the cost of this part of the project by doing the sheet piling work themselves instead of using sub-contractor. Not to mention the fact that they now have their very own Movax for future vibratory sheet piling work. After 3 days of training LDI’s operator was ready to commence work on the sheet pile retaining wall for the culvert upgrade. The Movax SG-45 is being used to insert and extract several hundred sheet piles on this project.